For more than 35 years Burlington Day Care and Preschool has provided high-quality, affordable child care in an early education environment. We are a family-orientated non-profit center dedicated to serving the diverse communities in our area. 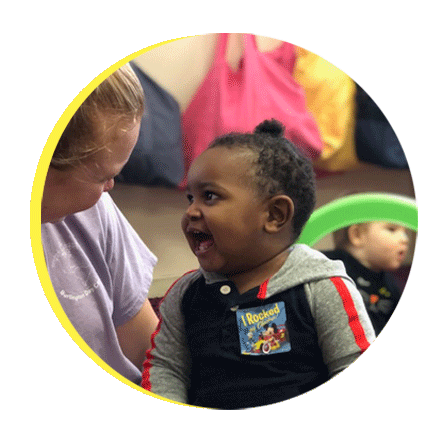 Burlington Day Care and Preschool is a developmentally-based child care center that offers child care for children ages 8-weeks to 6-years old. Our center provides a wide range of developmental opportunities for each child in an environment filled with security and love. The planned daily activities and curriculum (Frameworks) are designed to promote physical, social, emotional, and intellectual development. As two working parents, it was so important to us to find a place that our kids love to go to every day - one that provides a safe environment for them to learn, play, grow, and make friends. From the moment we first toured Burlington Day Care and Preschool, we knew it was the one for our family. We had toured a number of the bigger chains in the area and just didn't get that same nurturing, family feeling. The teachers are fantastic and many have been there for a very long time. The daily schedules do a nice job of combing age-appropriate, themed curriculum with play. Burlington Day Care has been like a second home for both of our children. If you have the chance to enroll your children, do it. We can't recommend BDC enough. Our son has been attending BDC since he was three months old. From the very first day the teachers at BDC have gone the extra mile for E, who required special physical and occupational therapy exercises from infancy. His infant room teachers were careful to learn the exercises and were invested in his development. From infancy to now almost two years old, all of E's teachers have been caring, thoughtful and supportive. I love that E gets to see and play with some of his old teachers every now and then as he ages up through the rooms, those connections are priceless. BDC is very much a family and it is evident from the way the teachers interact with the children and with each other. I started looking at day cares when I was 12 weeks pregnant, I never realized how competitive it would be! I thought I would never find the perfect daycare for my son. I accidentally found Burlington Day Care and Preschool and I'm so glad that I did! My son always has a huge smile on his face when I come to pick him up. I feel so comfortable knowing that my son is well taken care of when I have to go to work. I absolutely love this center and all the teachers and staff. Everyone is just so nice and welcoming. From the first day I went in I knew this would be the place my son would stay until he had to go to kindergarten. I can't say enough good things about Burlington Day Care and Preschool, we absolutely love it! I cannot say enough great things about the Burlington Daycare and Preschool! My daughter started there when she was 8 weeks old, dropping an 8wk old infant off to strangers is the most nerve-wracking thing I’ve ever done in my life. With tears in my eyes I handed my little one to Lisa and Renee them telling me it would be alright and to have a great day. It wasn’t at all but as I rushed back to get my bundle of joy I walked up to her room and she was cuddled up sleeping in Amanda’s arms. I knew it would be ok. If my baby felt that safe with another I would be ok too. She is 3 years old now and has thrived at the daycare. She comes home talking up a storm reciting songs, counting to 16 and the ABCs. She has made adorable relationships with her teachers and children in her classes. My 20-month-old son is also at the daycare and loves Michelle, Kaleigh and Lauren I don’t know who taught him to blow his nose but it’s hilarious. Micala always takes extra time with both of my children in the morning since on occasion they get upset when I leave. She sits with them while they eat breakfast and always wants to know how their weekends were. Any instructions I have ever given to the teachers has been followed to a science. They truly care. Jacquie the director has always shown the upmost interest in my children’s well-being and success. I would highly recommend this daycare to anyone; it’s not just a daycare or school it’s a family. I have been sending my kids to BDC for the past 3 years. I have always felt that the staff was an extension to my family. The staff is very loving and their attention to care rivals any other daycare/preschool in the area. My oldest graduated Pre-K in June and has since started kindergarten. Because of the solid foundation he received from BDC he is excelling in kindergarten. My youngest daughter has been going to BDC since she was 12 weeks old. She knows all of the staff by name, even if they are not her teacher. I have always been extremely happy with the care and curriculum that BDC provides and I would highly recommend them! © 2018, Burlington Day Care. All Rights Reserved.